D – Gallup, Inc. – Corner of Riverfront Dr. & Gallup Dr. in Omaha, Nebraska — All Gallup parking is available for Loessfest events. E – South River’s Edge Park parking — Just north of Harrah’s Casino, accessible from Harvey’s Blvd (9th Ave) and right onto Harrah’s Blvd. Note: Lot A in CenturyLink Center is no longer available for Loessfest parking. Take a left toward Harrahs Blvd. Turn left toward Harrah’s Blvd. Follow signs towards Harrah’s North Parking Lot. Follow signs to Loessfest event and parking. 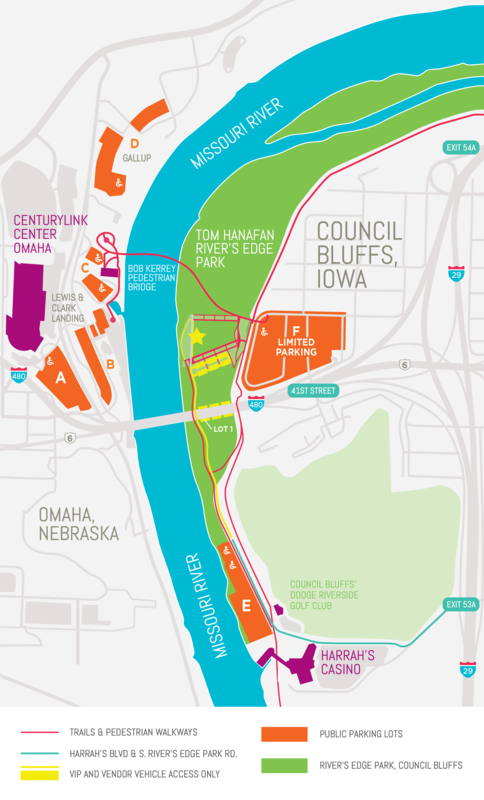 Parking for disabled guests is available in all lots, however handicap parking is recommended in lot E and C. Shuttles and golf carts will assist disabled guests from lot E.
Lot C (at the base of the Bob Kerrey Pedestrian Bridge on the Nebraska side) allows guests to access the park by crossing the bridge, which is handicap accessible.